Thomas Jefferson left the White House in March of eighteen hundred and nine. His secretary of state, James Madison, had been elected president. Jefferson believed the nation was in good hands. He returned to Monticello, his country home in Virginia, and never went back to Washington again. But Jefferson and the new president exchanged letters often. Jefferson offered advice on a number of problems that Madison faced as the nation's fourth president. There were many visitors to Monticello. But Jefferson was happiest when he could discuss books, government, science and education. This week in our series, Maurice Joyce and Kay Gallant discuss the final days of Thomas Jefferson and his lasting contributions -- to Virginia and the nation. Jefferson believed firmly in the value of education. His whole idea of government depended on the ability of citizens to make intelligent decisions. He spent the final years of his life building a better educational system for Virginia. Jefferson had been interested in education for most of his life. He had developed many ideas about the best way to educate the people. He believed that every citizen had the right to an education. But, he understood that all people do not have the same ability to learn. Jefferson divided the people into two groups: those who labor and those who use their minds. He thought both should start with the same simple education -- learning to read and write and count. After these things were learned, he believed the two groups should be taught separately. Those in the labor group, he thought, should learn how to be better farmers or how to make things with their hands. The other group should study science, or medicine or law. Jefferson did not wait long to begin working to improve education in Virginia. A group of men decided to build a college at Charlottesville, near Jefferson's home. Jefferson immediately offered to take a leading part in starting the school. He said he would plan the buildings and also plan what the students would study. He wrote to many of his friends -- experts in education. He asked for their advice. "We cannot always do what is absolutely best. Those with whom we act have different ideas. They have the right and power to act on their ideas. We make progress only one step at a time. To do our fellow men the most good, we must lead where we can, follow where we cannot. But we must still go with them, watching always for the moment we can help them move forward another step." Jefferson began by planning a program of studies for the Charlottesville College. But he did not stop there. Before he finished, he had completed plans for a complete education system for Virginia. He proposed a school system of three steps. The first step would be elementary schools, where all children could learn reading, writing, arithmetic and geography. These schools would be built in all areas of the state and would be paid for by the people living in each area. The second step would be colleges -- equal to the high schools of today. He proposed that nine of these schools be built in the state. Students would begin the study of science, or would study agriculture, or how to use their hands to make things. These schools would be paid for by the state. The third step would be a state university, where students of great ability could go to get the best of educations. The university would produce the lawyers, doctors, professors, scientists and government leaders. Young men whose families had money would pay for their own educations. The state would pay the costs of a small number of bright students from poor families. Jefferson also proposed that the University of Virginia be built at Charlottesville. He already had begun work on the college there and offered to give it to the university. His education program was offered to the Virginia legislature. Many lawmakers thought it was excellent. But many others opposed it. They did not want to raise taxes for the large amount of money such a system would cost. The legislature, however, agreed to part of the plan. It approved a bill to help pay the cost of educating poor children. And it agreed to spend fifteen thousand dollars each year for a university. There was much debate about where the university should be built. Several other towns wanted the school. Finally, Charlottesville was chosen. By this time, Jefferson had completed plans for the university buildings. 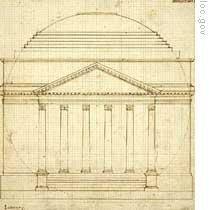 He borrowed many of his ideas from the beautiful buildings of ancient Greece and Rome. The buildings were so well planned that one hundred years later, when the university was to put up a new building, the builder could find no reason to change the plans drawn by Jefferson. Work began on the university immediately. But it was six years before the school was open to students. Jefferson was there almost every day, watching the workmen. He was quick to criticize any mistake or work that was not done well. When he was sick and not able to go down to the university, he would watch the work through a telescope from a window of his home. The cost of the university kept growing. And Jefferson had to struggle to get the legislature to pay for it. He also worked hard to get the best possible professors to teach at the university. He sent men throughout the United States to find good teachers. He even sent a man to Europe for this purpose. Finally, in March, eighteen hundred twenty-five, the University of Virginia opened. Jefferson's health had suffered during his years of work for the university. He was eighty-two years old and feeling his age. He suffered from rheumatism and diabetes, and was so weak he could walk only short distances. Jefferson also found his memory was failing. He knew he did not have much longer to live. He told a friend one day: "When I look back over the ranks of those with whom I have lived and loved, it is like looking over a field of battle. All fallen." As his health grew worse, Jefferson turned his thoughts to death. He wrote how he wished to be buried. He wanted a simple grave on the mountainside below his house. He drew a picture of the kind of memorial he wanted put at his grave. On this stone he wanted the statement: "Here was buried Thomas Jefferson -- author of the Declaration of American Independence, of the Virginia Law for Religious Freedom, and Father of the University of Virginia." He did not choose his work as governor of Virginia, secretary of state, or president. There was not a word about his purchase of the Louisiana Territory from France, which added so greatly to the United States. Jefferson did not explain why he chose the Declaration of Independence, the law for religious freedom, and the university as his greatest works. "He chose those points in his life when he performed some service in the unending struggle to free the human mind. Freedom from political tyranny, freedom from religious tyranny, and finally, freedom through education -- from all the tyrannies that have ever clouded and held back the human spirit." On the Fourth of July, eighteen twenty-six, the nation began its celebration of the fiftieth anniversary of the Declaration of Independence. Then, from Boston, came news that former president John Adams had died. His last words were: "Thomas Jefferson still lives." But Adams was wrong. At ten minutes before ten in the morning, on that same Fourth of July, his friend, Thomas Jefferson, had died. As the news of the deaths of the two great men spread across the country, the celebrations turned to mourning and sorrow. 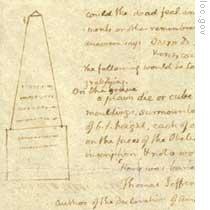 Jefferson was buried the next day, as he had ordered, in a simple grave on the quiet mountainside. To learn more about America's third president, go to www.unsv.com. We have transcripts, MP3s and podcasts of our programs along with historical images. Today's program was written by Frank Beardsley. Join us each week for THE MAKING OF A NATION – an American history series in VOA Special English. 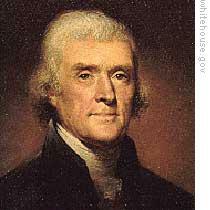 Thomas Jefferson left the White House in the end of the second presidency. He never came back to Washington. In his last life, he stayed in Monticello and discussed many iusses in disfferent areas. He devoted all energy to education in Virginia. Meanwhile he tried to set up a new university- the University of Virginia. the trhird President, the author of Declaration of Indepedence of America, the Father of the University of Virginia---opened in 1826, purchase of Louisiana territory from France --- Thomas Jefferson died in 1826, at the age of 82. His name have been and will have been living in the mind of all the people of the world. .... plus, he wrote the Declaration of Independence at the age of 32. What a great leader. Try to contribute to the nation. Not try make himself rich in asset. "He chose those points in his life when he performed some service in the unending struggle to free the human mind. Freedom from political tyranny, freedom from religious tyranny, and finally, freedom through education--from all the tyrannies that have ever clouded and held back the human spirit."